Reserve our newly remodeled club for your event. Whether it's a class reunion, wedding reception, party, or meeting, we have a variety of services at a reasonable price. Click below to find out more. 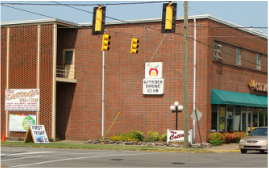 The Gadsden Shrine Club is an affiliated Shrine Club with the Zamora Shrine Center in Birmingham, AL. We serve the community in a variety of ways. Most notably, we see that children in our area needing care at a Shrine Hospital gets transportation free of charge to the child and his or her family. Reserve our newly remodeled club for your event. Whether it's a class reunion, wedding reception, party, or meeting, we have a variety of services at a reasonable price. Click below to find out more. Reserving our club not only gives you and those attending your event a clean and versatile space, but the income collected helps us to help others in our community. All proceeds collected go to help us fulfill our mission of helping children. Click below to donate. With each donation, you will receive a tax receipt in the mail. We thank you in advance. Rent our club for your event needs!